Qatar Airways have confirmed that they plan to put the Airbus A350 into XWB service on the Doha – Frankfurt route from 15 January in spite of a delivery delay. The first aircraft was due to leave Toulouse on 13 December but this did not happen due to what the planemaker described as "very minor issues" requiring more test flights. One of the biggest New Year’s Day turnouts of Classic vehicles in the country is likely to captivate spectators and participants at Brooklands Museum on 1 January. With over 1,000 vehicles and anything up to 5,000 people expected, there will be something for everybody amongst the classic and performance cars, historic commercial vehicles and motorbikes lined up on the historic concrete (and every other available bit of space) of the birthplace of British aviation and motorsport. The dates have been announced for Goodwood’s annual motoring extravaganzas for 2015 in June and September of next year. Last month the Airports Commission launched its public consultation on the three short-listed options for airports expansion in London and the South East. On Monday 8 December, Christmas came early for over 120 lucky children from the North West thanks to the Thomas Cook Children’s Charity, Bauer Media Group’s ‘Cash for Kids’ charity, Hamleys and Thomas Cook Airlines. a healthy and prosperous 2015. The next editon of BTN will be Monday 5 January 2015. 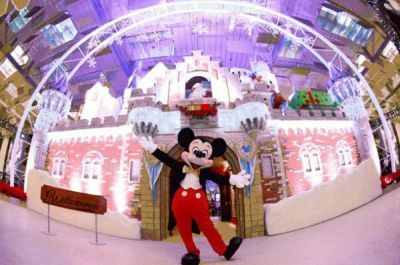 A sprinkling of snow; a touch of winter and a dazzle of Disney magic will welcome travellers and visitors this Christmas as Changi Airport (Singapore) transforms into a winter wonderland, bringing yuletide festivities to life. Following the popularity of its annual year-end celebrations, it is once again pulling all stops to bring happiness to its visitors, and this time, with the company of all-time favourites – Mickey Mouse and Friends. Delivered to Aviation Club members and their guests at the IOD last week. After nearly 45 years since its first flight (February 1969), and 1,500 delivered, the remarkable Boeing 747 soldiers on. Tales of its demise seem to be premature. Its future is mainly seen as a freighter with Airbus abandoning a cargo version of the A380. Please note this is not the air chaos story in this issue. British Airways continues to place first in Heathrow’s Fly Quiet table, which lists airlines according to how quiet their operations are. The iconic British retailer Fortnum & Mason has opened its first airport store and bar at Heathrow T5 just in time for Christmas. Welcome to the Business Travel News Christmas Quiz 2014. You don’t have to actually enter but do attempt the answers. The fun is taking part. Ask your friends to help. As we are all in a World War I commemorative mood there is an abundance of elderly aircraft. We will reveal the correct solutions on Monday 5 January, our next publishing date. Closing day is midnight Friday 2 January (all times GMT), there is no cash prize alternative and the Editor's decision is final. Speaking at an investors’ event in London last Wednesday Harald Wilhelm, Chief Financial Officer of Airbus, seemed to indicate the shutdown of its A380 superjumbo production line as soon 2018. Assembled at Toulouse, and subsidied during its development, the A380 has never made an operating profit for Airbus, although it says it should by 2015. First flown in 2005, it made its airline debut in 2007 with Singapore Airlines. There has been a furious reaction to the London analyst briefing by Airbus which seemed to indicate that the Airbus A380 could go out of production in 2018 (see part 1). Long haul is the latest target of the resurgent Air Canada. The airline will introduce non-stop services from Toronto to Delhi and Dubai in November 2015. The routes, the first to be dedicated to Air Canada's Boeing 787-9 series aircraft, will offer new opportunities for the airline. Patrick McLoughlin, Transport Secretary, will be questioned when he appears before the House of Commons Transport Select Committee later today (15 December) following Friday’s air traffic chaos, which he himself described as "unacceptable". Suntec Singapore International Convention & Exhibition Centre, is the venue for Aviation Festival Asia 12-13 February 2015. Never flown or concerned about flying? Or is someone close to you nervous about taking to the air in a metal tube. Or even a plastic one these days. While millions sit down to their Christmas lunch on 25 December, Heathrow is making sure its passengers do not miss out. Every traveller passing through the airport on the day will be offered traditional Christmas after dinner sweets that can be enjoyed at 30,000ft. The Christmas holiday time would seem a fine opportunity for an airline to announce its summer plans for 2015, for both business and leisure travellers. With a new CEO appointed, new owners and new Motorway access, Luton Airport (LLA) has signalled the start of a £100m transformation programme by unveiling an innovative video update of its future. Celebrating 70 years of flying into the United Kingdom, Icelandair will launch direct flights from Birmingham on 5 February connecting to 14 onward destinations in America and Canada. These will operate on a Monday and Thursday. The Gran Meliá Xian has opened, a flagship hotel for the brand in Asia Pacific. It is located in the new district of Qu Jiang, near the ancient city wall and home to all the biggest shopping malls and the convention centre.